Mitchell Breuer Earns 100th Career Victory! Senior Mitchell Breuer has hit another career milestone in the Goodhue Wrestling program. As a junior, he notched his 75th win and 50th pin of his career. And now early into his senior campaign, he’s hit the century mark – 100 career victories. He earned his 100th victory in the first round of the Chisago Lake Invite on Friday, December 14th. Mitchell is now in his 5th year as a Varsity starter. 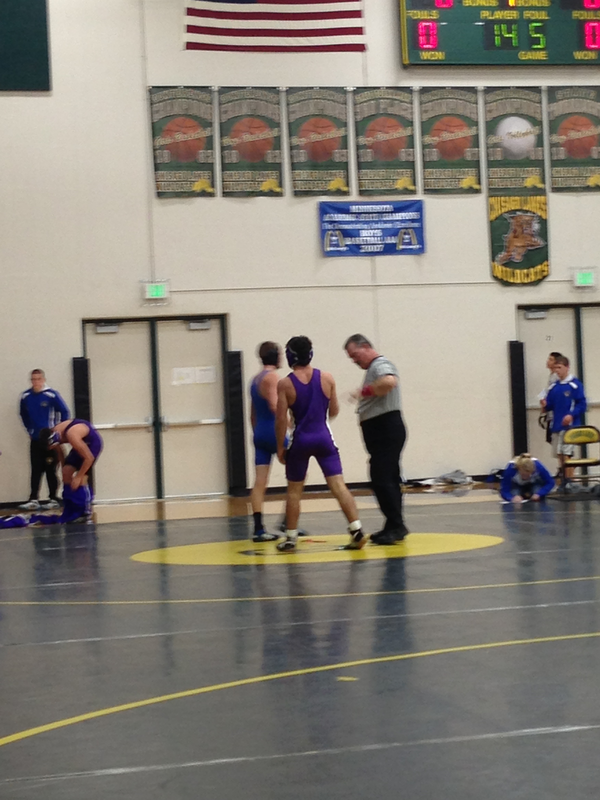 And of those 101 victories he now has, a staggering 61 of them have been by pin! With 5 wins by pin so far this year, he continues to close in on 75 pins for his career as well. He’s certainly on track to do it, only needing 14 more. Mitchell has pinned 15 or more opponents in each of the past two years, and pinned 12 as a freshman. 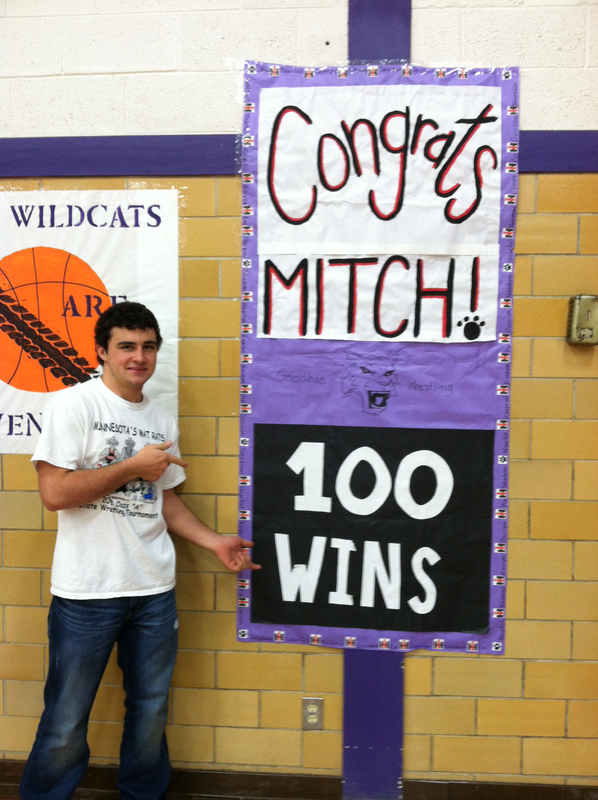 Congratulations Mitchell on 100 victories, and to the many more you’ll earn in your last two months of your career! The Thursday, December 20th triangular that was cancelled due to schools being closed on account of the snowstorm has now been rescheduled. We will now wrestle La Crescent and Stewartville on Friday, February 8th. The girls basketball games against Triton that were to take place that evening have been moved back one night to Thursday night to accommodate everyone’s schedule. We hope to see you then! Our first home event of the 2012-13 season has been postponed due to the weather-related school cancellations today. We will not practice today either. Assuming we are in school tomorrow, we will practice after school for an hour just as we had planned before. The triangular with Stewartville and La Crescent has been postponed. I will not know a rescheduled date today. I will let you know as soon as I do so we can update our calendars. We did look at Friday night, but there were gym conflicts. We looked at Saturday, but feared too many people had travel and holiday commitments that would create conflicts. Goodhue Wrestling will not see any action until January 3rd when we will travel to (as scheduled) #2 ranked Kasson-Mantorville. Goodhue Wrestling will kick off its first of three home dual events tomorrow night. Up first for the Wildcats is La Crescent, followed by a dual between La Crescent and Stewartville. After those two duals, Goodhue will complete the evening with its final HVL conference dual of the evening against Stewartville. Start times are approximate for the last two duals. We will also be celebrating two Goodhue seniors for separate accomplishments… We hope to see you there! Yesterday your wrestler should have delivered to you a letter from the MN Department of Health regarding a 7-12 wrestler who had a confirmed case of Pertussis. Because Pertussis can be contagious, the MDH wanted me to inform you and distribute a letter so you are aware of the potential symptoms and the protocol for identifying if there is a case. I’ve attached a copy of the letter: MDHPertussisNotification20121217. If you have any further questions or concerns, please let me know. And, as the letter indicates, if you are concerned about your wrestler’s cough, please do see a medical provider as soon as possible. In a few days we’ll be hosting our first annual Goodhue Jr. High Tournament. We are excited to have a great tournament right here in Goodhue again for our young wrestlers. This is a Jr. High Tournament, meaning it’s only for wrestlers in grades 7-9, plus beginner wrestlers that might be older. Weigh-ins and skin checks start at 7:15 for Goodhue wrestlers, and three weigh-in windows follow. We will have a coaches meeting to finalize brackets from 8:30 – 9:30, and hopefully get the tournament started around that 9:30 mark. We’ll be running 4 mats – two in each gym with 8 man brackets. We have medals for wrestlers who place in the top 3. We have 15 teams attending, so there will be plenty of full brackets and great wrestling to watch. Concessions and set-up/break-down crews are in place. Thank you in advance to everyone who has been or will help with this tournament! The Varsity wrestlers will be traveling to Chisago Lakes for an individual tournament. Who: Varsity wrestlers only; no practice at school for the remaining wrestlers. Setup for the Jr. High Tournament will be after the GBB game in Gym 3, then after GBB Varsity in Gym #2.